The play was first performed to high acclaim in 1996. 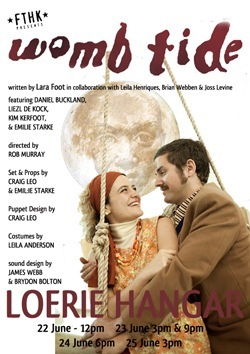 In 2010, the show will be recreated and devised by a cast of hot up-and-coming performers (we use nothing but here at FTH:K) including our very own Liezl de Kock and Emilie Starke (also working on the set and props), and collaborators Daniel Buckland, and Kim Kerfoot, under the direction of Rob Murray. A stellar cast of designers has been assembled, including James Webb and Brydon Bolton (sound), Craig Leo (puppet design & set and props), and Leila Anderson (costumes). More than just simply a remounting, Womb Tide is a complete overhaul of the original story, given FTH:K’s approach to creating fresh, startling, visually-accessible work. This is driven and given weight by the mentoring of director, Rob Murray, by Lara Foot herself, as well as FTH:K’s Company Director, Tanya Surtees, by arts organisation, the Kennedy Center in Washington DC. At its heart, Womb Tide is an unconventional love story. Set in the mid to late twentieth century South Africa, it follows an eccentric and somewhat dysfunctional family through a story of love, loss and ultimate hope, and paints an impressionistic portrait of the complexities of family life. Told through the memory of a child, it is at once deeply moving, funny, dark, heartbreaking, and ultimately redemptive. Presented by FTH:K, and featuring a stellar cast and crew, Womb Tide is a paean to love and perseverance, and a tour de force of visual and physical storytelling. I WOULD LOVE TO SEE IT…!! great poster, by the way! All the best in Grahamstown, GO GO GO FOR IT! I’ll be supporting from far away… ! So sorry I will not be in SA for Laura Foot’s play. Hi Joan. Sorry that you will be missing the show. I am not sure if the text is available but will check with Lara. As for your dates, it seems you will be missing us at every turn! Aug/Sept we will be preparing for/in JHB at The Market Theatre but we’ll keep you posted for performance dates in the new year. In terms of ease of navigation, this is our blog, not website. Our website (www.fthk.co.za) will be launched by the end of the week so keep an eye out for it.